McNary Dam, in Northeastern Oregon on the Columbia River, is not as famous as Grand Coulee Dam or other iconic projects that help propel the Pacific Northwest economy. Tucked away near the communities of Umatilla and Hermiston, McNary Dam is as low-key and unpretentious as any giant hydroelectric project that has the capacity to provide electricity for roughly 686,000 homes. 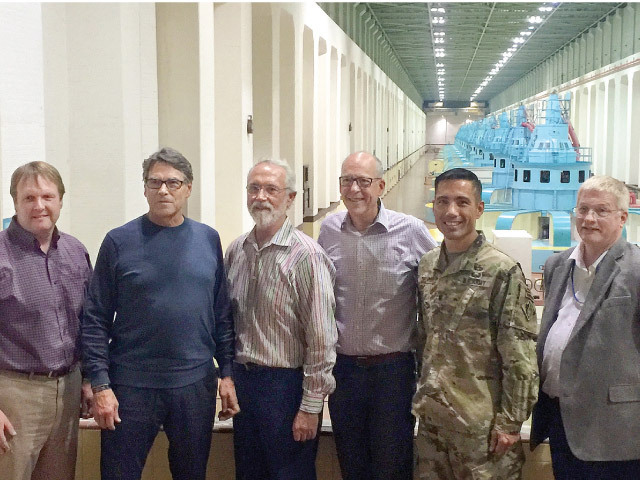 In August, McNary Dam came out of the shadows, gaining a level of well-deserved notoriety when U.S. Secretary of Energy Rick Perry visited the 7,000-foot-long structure. Perry made the trip at the behest of Congressman Greg Walden (R-Hood River), who represents Eastern Oregon in Congress and serves as the formidable chairman of the House Energy and Commerce Committee. Perry’s visit to the Northwest—his first as energy secretary—came as Walden’s committee kicked off high-profile hearings titled “Powering America,” which are focused on potential reforms related to the electrical grid. Perry’s visit included a tour of McNary’s powerhouse. From left are BPA Administrator Elliot Mainzer; Perry; Newhouse; Walden; Lt. Col. Damon A. Delarosa, U.S. Army Corps of Engineers; and Rick Werner, chief of operations, U.S. Army Corps of Engineers. There are few regions of the country where Perry’s department has more significant domain. The Bonneville Power Administration and the Pacific Northwest National Laboratory in Richland, Washington, are just two examples of the department’s sweeping jurisdiction. After marveling—and tweeting—about the spectacular aerial view of Mount Rainier and landing in Washington state, Perry crossed over into Oregon and toured McNary with Walden and U.S. Rep. Dan Newhouse, who represents Washington state’s Fourth Congressional District. McNary is one of several dams on the Columbia and Snake rivers that has astonishing success with fish passage. Ninety-eight percent of steelhead successfully pass through the dam. 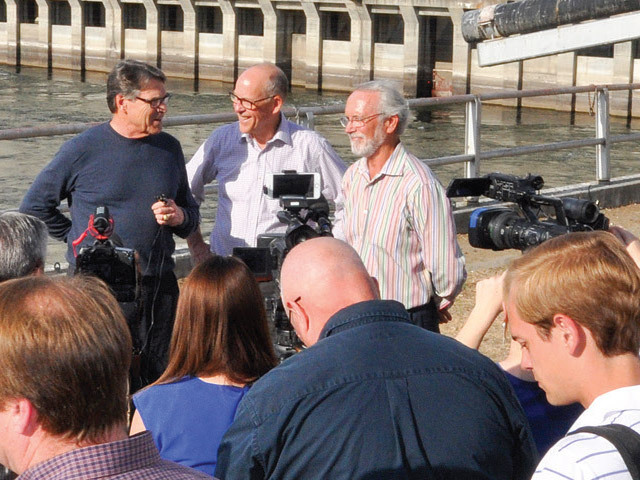 Following the press conference, Perry, Walden and BPA Administrator Elliot Mainzer, who also attended the tour, held a stakeholder meeting at the dam with a small group of Pacific Northwest energy leaders. 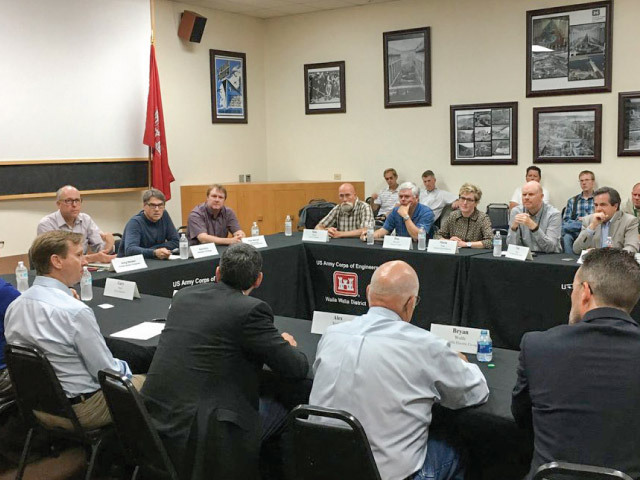 The group included Robert Echenrode, the CEO of Hermiston-based Umatilla Electric Cooperative; and Bryan Wolfe, a prominent local farmer and member of Umatilla’s board. During the 90-minute roundtable discussion, which covered topics from transmission to the future of wind farms, Perry outlined his vision of America’s energy future. “I am an ‘all-of-the-above’ energy guy,” he said, noting America will need natural gas, coal, wind and other renewable resources, such as hydroelectric power, to meet its growing electricity demand. Perry also did not shy away from discussing the Trump administration’s controversial proposal to auction off BPA’s 15,000 miles of transmission assets—an idea universally opposed by public power advocates and one that is meeting stiff resistance in the halls of Congress. “You shouldn’t be afraid—from time to time—to have conversations about being more efficient and defending your program,” he said. Echenrode briefed Perry on the proliferation of energy intensive data centers in Oregon’s Columbia Basin. “When I was governor of Texas, I tried to recruit every data center I could,” Perry said. Wolfe told Perry irrigation from the Columbia River was critical to the area’s thriving agricultural sector. Perry, a former agriculture commissioner from Texas, is no stranger to rural issues or areas with little population density. Recalling that his father used to call parts of rural Texas “the Big Empty,” Perry also discussed his deep history with Texas electric cooperatives and the challenges faced by rural utilities. He also lamented that while Texas had a diverse range of energy resources, the Northwest’s hydroelectric system is in a class by itself.